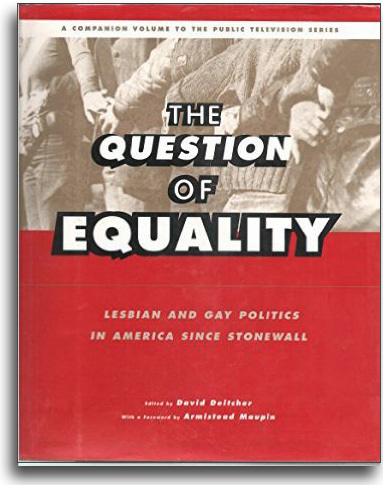 The Question of Equality investigates the central challenges that confront the lesbian and gay civil rights movement in the United States. Moving beyond the rhetorical bravado of gay pride, this book has the courage to discuss the movement and its history as an often anxious affiliation of outsiders whose differences cannot – indeed, should not – be ignored. The Question of Equality accompanies the public television documentary series of the same name – the first ever to deal with this subject, and scheduled to air in October 1995. But this book has been conceived from the start to exceed the scope of the series with archival and contemporary photos, works of art and poetry, comic strips, and original, chapter-length essays by four noted authors. Each lavishly illustrated essay is followed by “In Their Own Words,” an oral history section that gathers the testimony of individuals whose private experience places them at the center of public conflicts.